Johnny Depp and Amber Heard’s divorce may have been finalised in 2016, but the litany of allegations between the two continues on nearly three years later. Their break-up was tumultuous: Amber accused the actor of physically abusing her throughout their 15-month marriage and secured a restraining order against him at the time. He has always denied the claims, insisting she was falsifying the accusations to boost her profile. At the time, they settled out of court and she received a $7m settlement, all of which she donated to charities and they both released a statement that both parties pre-approved before sending to the public. “Our relationship was intensely passionate and at times volatile, but always bound by love. Neither party has made false accusations for financial gain. There was never any intent of physical or emotional harm,” it read. “Amber wishes the best for Johnny in the future. Amber will be donating financial proceeds from the divorce to a charity. There will be no further public statements about this matter." Since their split, Amber has become a vocal advocate for women’s rights and the #MeToo movement, and most recently, she wrote an op-ed for the Washington Post in which she detailed the backlash she received at the time for accusing a very famous man of violent behaviour, although the piece never mentioned him by name. Depp has now launched a $50m defamation lawsuit against her, and claims he has a number of witnesses who can debunk her account of abuse. His lawsuit claims the allegations of abuse were an “elaborate hoax to generate positive publicity", adding “Ms. Heard is not a victim of domestic abuse; she is a perpetrator,” his lawyers wrote in court papers. Heard’s lawyer Eric M. George responded saying the suit is “frivolous” and that his client “will not be silenced”. “Mr. Depp’s actions prove he is unable to accept the truth of his ongoing abusive behaviour. But while he appears hell-bent on achieving self-destruction, we will prevail in defeating this groundless lawsuit and ending the continued vile harassment of my client by Mr. Depp and his legal team,” Mr George said in a statement. Heard and Musk were romantically linked for 10 months last year before splitting in December 2018. Depp’s lawyer said they intend to subpoena Heard, Musk and three friends of hers who corroborated her stories of violence in their marriage at the time of their divorce when she was seeking a restraining order. “We look forward to holding the overwhelming video, photographic and eyewitness evidence we finally possess up against Amber Heard's (so far silent) attempts to explain the inexplicable,” he said. Heard said after she made the claims, she was dropped from a two-year contract to be the face of a fashion brand and was recast in a movie and her future in Justice League and Aquaman franchises were in doubt. Depp said he was dropped from a lucrative role as Captain Jack Sparrow in Disney’s Pirates of the Caribbean franchise less than one week after the op-ed was published. The 55-year-old actor is also suing The Sun newspaper for libel after he was described as a “wife beater” by the publication and said in January he would use new evidence to disprove allegations of abuse. Adam Waldman, his attorney, said they have "dozens of video security tapes” and “eyewitness statements” that rebuke the timeline as Heard recalls them. 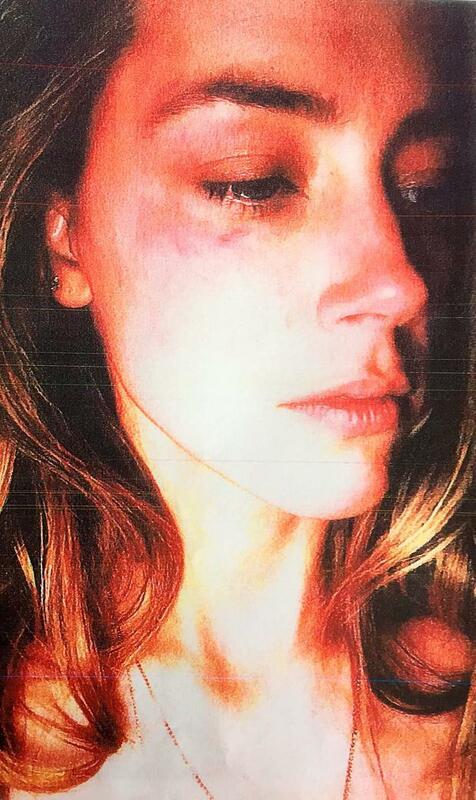 In particular, the suit references an alleged incident on May 21, 2016 during which Heard accused Depp of throwing a mobile phone at her "with extreme force" hitting her eye and cheek. In papers lodged at the Los Angeles Superior Court, she said he “began obsessing over something that wasn’t true” and “became extremely angry”. Police were called to the former couple’s home in May after the alleged incident and an LAPD spokesperson said at the time, “Officers investigation determined that a crime did not occur." Raquel Pennington, a friend of Heard's supported her version of events, saying she witnessed him swinging a bottle of wine "like a baseball bat". Her other friend Tillett Wright recalled arriving to their home in December 2015 after an incident in which Heard said she feared for her life. "The reports of violence started with a kick on a private plane, then it was shoves and the occasional punch, until finally, in December, she described an all-out assault and she woke up with her pillow covered in blood. I know this because I went to their house. I saw the pillow with my own eyes. I saw the busted lip and the clumps of hair on the floor," she wrote in an essay for Refinery29. On another occasion, she accused him on throwing a “magnum size bottle of champagne at the wall and a wine glass on me and the floor” on April 21, 2016. Witnesses said there was no visible smashed glass in the apartment in April and she had no visible injuries in May, according to court documents.